SUPPORT: Salemtown Board Co. Rejuvenated For New Movement. Buy A Board, Change A Life. Salemtown Board Co. Rejuvenated For New Movement. Buy A Board, Change A Life. Press Release from Salemtown Board Co.
Nashville, TN (11/11/2013): Salemtown Board Co. is impacting the lives of inner-city youth; one skateboard at a time. Their story began with a dream to change their city through building beautiful, high quality skateboards. 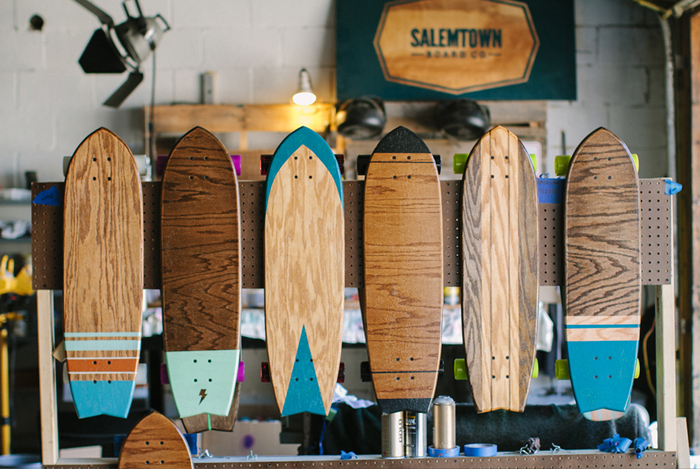 With no money, a tank full of gas, some reclaimed oak, and access to a vintage wood shop, Jacob Henley and Will Anderson brought a vision to life, establishing Salemtown Board Co. in November 2012. Salemtown Board Co.’s objective is simple: to employ, train, and mentor urban youth of Nashville, Tennessee, by building handmade, one-of-a-kind skateboards. Shortly after the launch, founders Henley and Anderson were able to hire Kendrius, a high school senior from the Salemtown neighborhood, as their first employee. In 2013 Salemtown Board Co. set out to sell 100 skateboards, a goal that would allow them to open their own shop in the Salemtown neighborhood and begin a college fund for for Kendrius to pursue a major in art. As of April 2013, thanks to reaching their goal and a donation from a Nashville business owner, Salemtown Board Co. opened their shop in an old loading dock located in the Salemtown neighborhood. In addition to launching their shop, Salemtown Board Co. has since hired Brandon, their second employee from the Salemtown neighborhood. Riding the current wave of momentum, Salemtown Board Co. has revealed a complete re-launch of their brand including a new logo, website, video and a fresh line of apparel. All of the creative work was done for free thanks to a team of Nashville creatives who believe in the vision and want to participate in the company’s success. Brad Davis (Action Hero Design), Tom Oakerson (tomoakerson.com), Jeremy Mitchell (Red Pepper Agency), and Darius Fitzgerald (dariusfitzgerald.com) all donated their time and creative insight to the re-launch. With your support, every dollar from the purchase of Salemtown Board Co.’s hand crafted skateboards or apparel is helping to employ, train, and mentor the inner-city youth of Nashville. “In this zip code, 37208, we have one of the country’s highest infant mortality rates. The majority of the kids that live in lower-income homes are living without their fathers. Teenagers, especially young men, are dropping out of high school like crazy. I believe what these kids need is love and positive role models in their lives,” Jacob Henley, Founder of Salemtown Board Co.
Jacob Henley and Will Anderson, men with a passion for helping inner-city youth, started Salemtown Board Co. in November 2012. 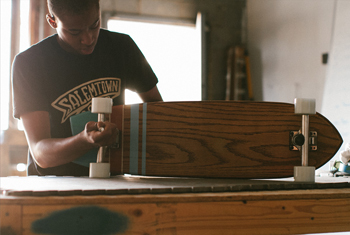 Salemtown Board Co. builds handmade skateboards and employs, trains, and mentors urban youth in Nashville, TN. Buy a board, change a life.